Thlothlopopka-Hatchee, “the creek where fish are eaten” (Boning) long before it was paddled for recreation. I’ve wanted to kayak this creek for some time. After all, Carter et al. gives it an A+ for scenery; I knew it would be amazing. However, I found that during the dry season, the water level was too low for paddling—unless of course, I didn’t mind carrying my kayak for much of the trip! So, I waited for the rain, and then, I waited for the rain to stop. Finally, I decided to paddle Fisheating Creek, rain or shine. 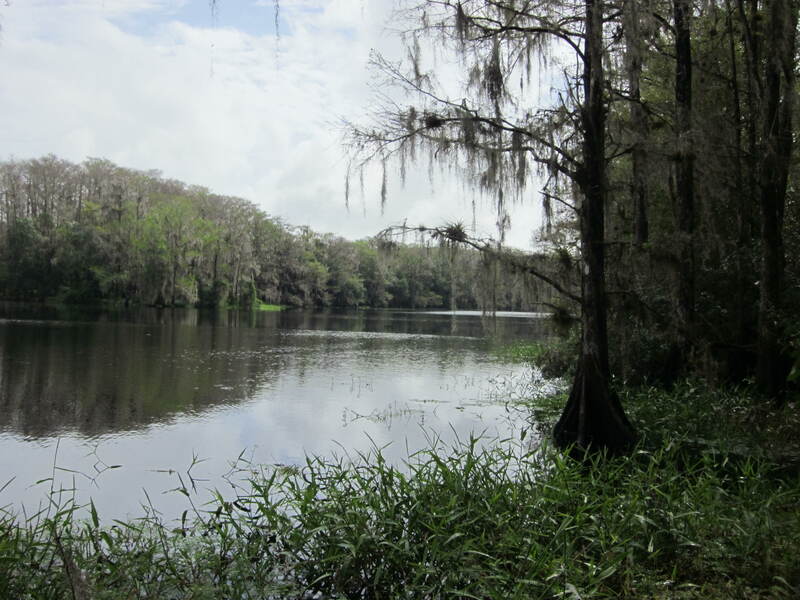 Originating in a swamp in Highlands County, Fisheating Creek flows south, then east, for 48 miles. 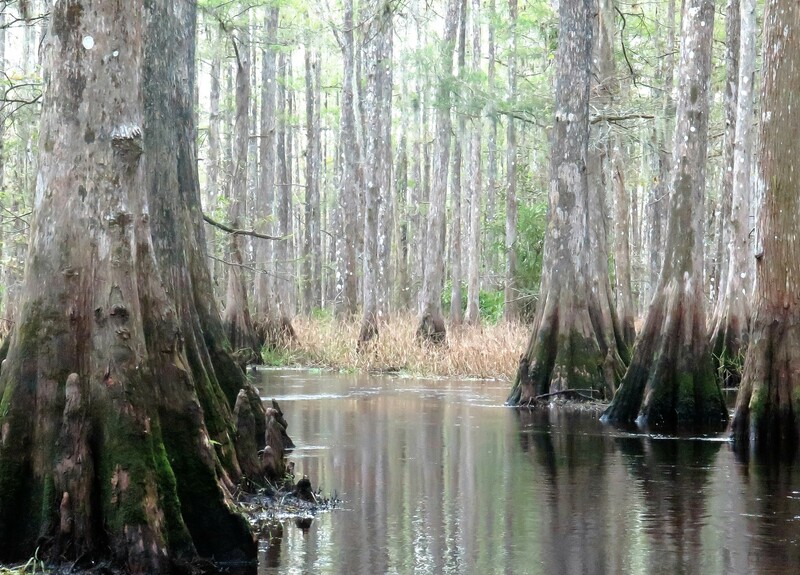 It passes through the cypress swamps, much within the state-owned Fisheating Creek Fish and Wildlife Management Area, and then this tea-colored creek eventually empties into Lake Okeechobee (Boning). On this Sunday morning, I paddled with a new friend, Rick Murphy, who hails from the Hendry County area. We rented kayaks from Fisheating Creek Outpost, and they dropped us at Burnt Bridge about 11:00. We would have an 8-mile paddle downstream to the Outpost in Palmdale which would take us about four hours. The sun had just peaked from beneath the clouds, promising us a good paddle. The creek was wide at the put-in. 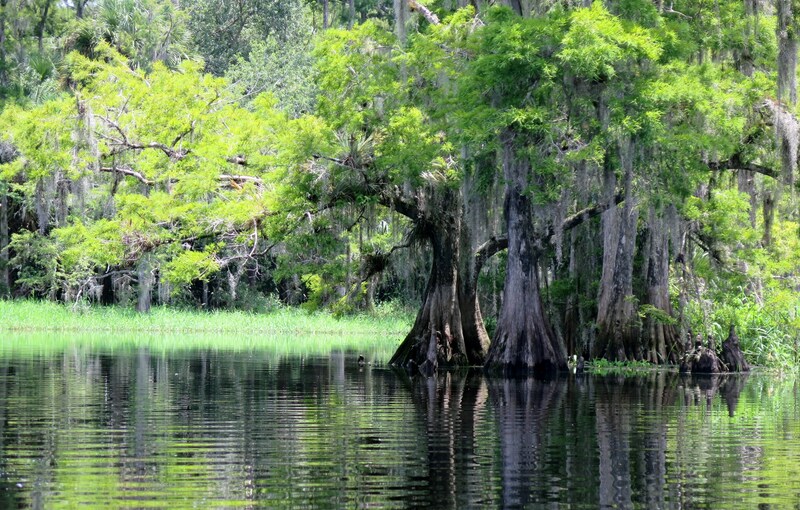 Tall cypress trimmed its edges—brown and bare this time of year—but cloaked in air plants and Spanish moss which shimmered silver in the sunlight. During the four-hour trip, the sun was in and out as were our rain covers. During the last 30 minutes of our paddle, the rain drenched us! The creek and surrounding scenery awed us. 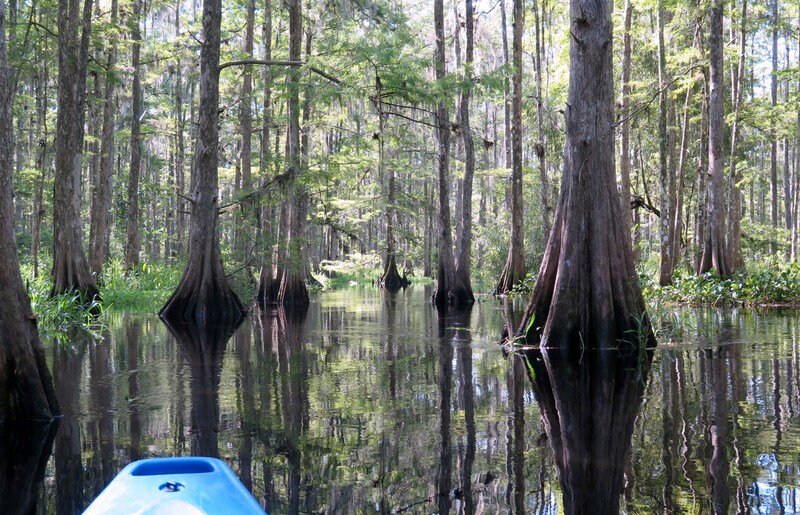 One moment we paddled in open waters, the creek, 40 feet or wider, and in the next moment, the dark waters took us swiftly, twisting and turning through the cypress swamp. 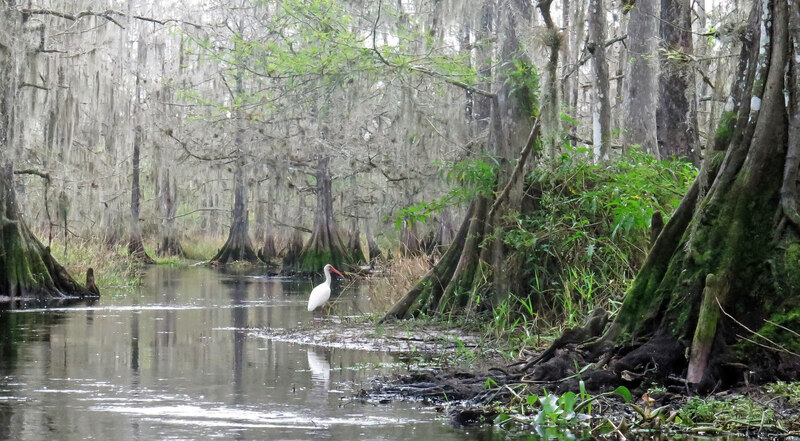 Wood storks and ibis dominated this Florida wonderland, but we also spotted various herons, blackbirds, vultures, anhingas, egrets, and even a turkey. We became accustomed to the alligators that often crossed in front of us or that sunned on the sand banks as we passed. We owned the creek for nearly the entire paddle, and neither the occasional rain nor the humongous spider that slipped down my shirt as we put in dampened our spirits. 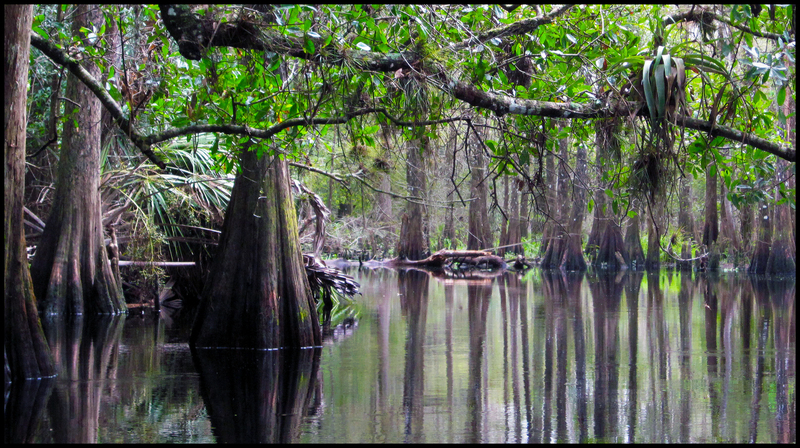 Fisheating Creek is an amazingly authentic, awe-inspiring Florida wilderness experience.